Crickhowell High School is a very successful school and your child plays their part in making it so. We aim for an environment which enables and encourages all members of the community to reach out for excellence. For our children to gain the greatest benefit from their education it is vital that they attend regularly and your child should be at school, on time, every day the school is open unless the reason for the absence is unavoidable. Learning:- Any absence affects the pattern of a child’s schooling and regular absence will seriously affect their learning. Any student’s absence disrupts teaching routines so may affect the learning of others in the same class. Helping to create a pattern of regular attendance is everybody’s responsibility – parents, students and all members of school staff. Since March 2001 there has been an aggravated offence, where a parent of a child of compulsory school age who, knowing that their child is failing to attend regularly at school, fails without reasonable justification to cause their child to attend. …that’s nearly ONE WHOLE SCHOOL YEAR! A student becomes a ‘persistent absentee’ when they miss 15% or more schooling across the school year for whatever reason. Absence at this level is doing considerable damage to any child’s educational prospects and we need parent’s fullest support and co-operation to tackle this. PA students are tracked and monitored carefully through our pastoral system and we also combine this with academic mentoring where absence affects attainment. Contact us as soon as possible on the first day of absence. If you need to report your child as absent, then please let us know by 8:40 each morning by ringing 01873 813500 and following the instructions to ensure that your message reaches the appropriate destination. Please indicate clearly your child’s name, year group, form and the reason for absence. The absence line will close at 8:40 and will then reopen at 4pm. This allows us to properly record all absences and notify parents of any students who are not in school and for whom we have not received an absence notification from parents. The use of a specific attendance message line frees our office team to deal with the urgent business of the day. Refer the matter to the Powys County Council Attendance Officer if attendance moves below 85%. Wherever possible routine appointments like a dental check-up should not be scheduled for school time. To ensure safety, it is expected that a responsible adult will collect your child from the General Office before they depart for their appointment. If this is not you as the parent, please let the school know who you have given permission to collect your child. Your child cannot go offsite at lunchtime – unless you have arranged with the school for them to go home for lunch on a regular basis. Students in Years 11, 12 & 13 may go off site for lunch but must remember that this privilege is conditional upon continued good behaviour. Poor punctuality is not acceptable. If your child misses the start of the day they can miss work and do not spend time with their class teacher getting vital information and news for the day. 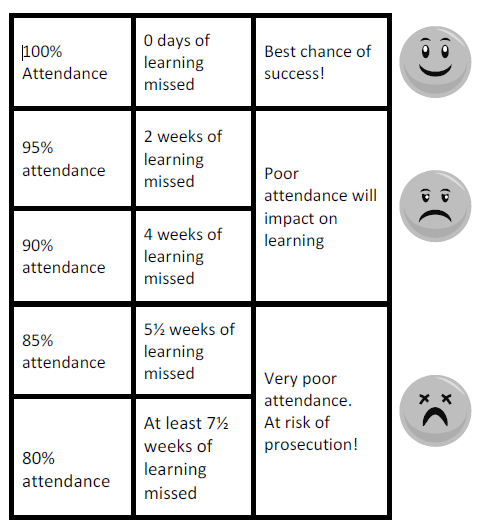 Late arriving students also disrupt lessons, can be embarrassing for the child and can also encourage absence. LATENESS ADDS UP! The school day starts at 8:40 am and we expect your child to be in class at that time. Registers are marked by 8:55 am and your child will receive a late mark if they are not in by that time. At 9.30am the registers will be closed. In accordance with the Regulations, if your child arrives after that time they will receive a mark that shows them to be on site, but this will not count as a present mark and it will mean they have an unauthorised absence. This may mean that you could face the possibility of a Penalty Notice if the problem persists. We are not authorised to support any application to take time off in school time to go on holiday. Taking holidays in term time will affect your child’s schooling as much as any other absence and we expect parents to help us by not to take children away in school time. Remember that any savings you think you may make by taking a holiday in school time are offset by the cost to your child’s education. We will not agree to any period of leave taken in school term time and all absence of this type will be classed as unauthorised and may attract sanctions such as a detailed in the Welsh Government All Wales Attendance Framework http://wales.gov.uk/docs. The preferred level of attendance for this school is 95 % + attendance and we will keep you updated regularly about progress to this level and how your child’s attendance compares. Our target is to achieve better than this however because we know that good attendance is the key to successful schooling and we believe our students are amongst the best in the Principality. All school staff are committed to working with parents and students as the best way to ensure as high a level of attendance as possible and that every child’s welfare and life opportunities are promoted. I have read and understood the terms and conditions of the attendance policy at Crickhowell High School.